Monday, May 28 at Dynasty Typewriter in Los Angeles. Atsuko Okatsuka was born to be on a Japanese game show. Her parents apparently met on one. Now she hosts one, sort of. 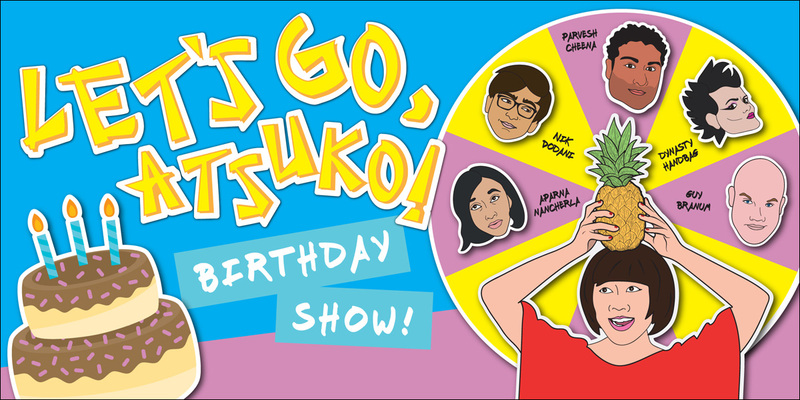 If you're in Los Angeles, join Atusko and friends for Let's Go, Atsuko!, a night of interactive games, videos, discussions and talent from notable comedians, political thinkers and public figures in the style of, yes, a Japanese game show. The lineup includes standup by Aparna Nancherla, music by Dynasty Handbag, and panelists Guy Branum, Nik Dodani, Parvesh Cheena and Jibz Cameron. Atsuko Okatsuka hosts a night of interactive games, discussions, and talent from notable comedians, political thinkers, and public figures in the style of a Japanese Game Show. LATE NIGHT meets Japan Meets....YOUR MOTHER. Stand Up by: Aparna Nancherla! For more information, and to purchase tickets, go here.